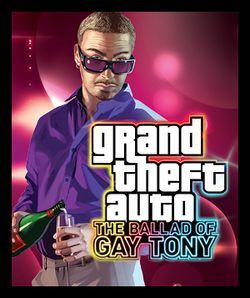 Grand Theft Auto: The Ballad of Gay Tony is the second of the two episodic expansion packs available to the Xbox 360, PlayStation 3 and Windows versions of Grand Theft Auto IV, which was developed by Rockstar North and first released for the Xbox 360 on October 29, 2009. It was then released for both the PlayStation 3 and for Microsoft Windows on April 13, 2010. It is the fourth expansion pack in the Grand Theft Auto series, and the fourteenth release overall. The Ballad of Gay Tony follows the exploits of a new protagonist, Luis Fernando Lopez, a recent member of the Dominican drug dealers and the personal bodyguard of Anthony Prince, who is also referred to as "Gay Tony". He is the owner of the two largest nightclubs within Liberty City as well as a high-status socialite. This page was last edited on 9 July 2016, at 18:20. This page has been accessed 9,686 times.